Camping is one of the best ways to thoroughly experience the outdoors, however, this whole adventure can quickly turn into your worst nightmare if you don’t get a good night’s sleep. In the end, the point of camping is not to exhaust yourself to the level where you are incapable of even getting up from the bed. Thanks to the many modern and innovative camping gear options, you now have the opportunity to go camping and enjoy the beauties of nature without compromising your comfort. One of the first and most important pieces of camping gear is the sleeping bag and choosing the right one starts with taking into account your destination and the temperature you are to expect there. For example, car camping bags have a wider cut and can offer a lot more room to roll around when sleeping. The main downside of these sleeping bags is that they cannot retain body heat. This makes them appropriate for warmer places. Backpacking bags, on the other hand, are lighter in weight but can provide you with more warmth and comfort because they are filled with duck or goose down. In order to make your sleeping more comfortable, you can add a sleeping pad that can be found in three types – self-inflating, air and closed-cell foam. The number of people who prefer to sleep without a pillow is small, so if you too prefer to sleep on a soft and comfy surface, choosing a quality camping pillow is a must. 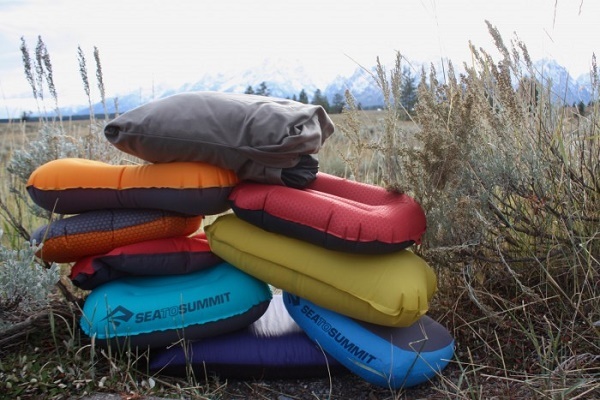 Available in three types – inflatable, compressible and hybrid, any of these camping pillow options will be a better choice that no pillow at all. Compressible pillows, for example, can be filled with different feathers, foams, synthetic fibres or a combination of the three and the main benefit of these types of pillows is that they are extremely soft and comfy. The inflatable models, on the other hand, are lighter as they are filled with air, and are way firmer than the compressible ones. Easy to pack and fold, all you need to do is to unpack it before sleeping and blow in air through its valve. Simple as that! Last but not least, the hybrid ones are something in between the aforementioned models as they have a compressible top layer for the head to rest and an inflatable bottom side for additional support. Eye masks and earplugs are another important type of gear you need to own if you want to have a peaceful, comfortable and good night’s sleep. Earplugs can block or at least reduce the outside noise, especially in summer, or the one coming from your snoring mate (chuckles) while eye masks can help you stay undisturbed from any kind of ambient light.